Later this year, we’ll be switching the site over to HTTPS only, instead of both HTTP and HTTPS as it is now. If you use the site in a browser, this should not have any impact on you, but if you have an API that is using HTTP, you’ll want to get that updated to use HTTPS. I’m currently attending php[world] 2016 and went to a great talk by David Stockton on integrating SMS and voice calls with PHP. 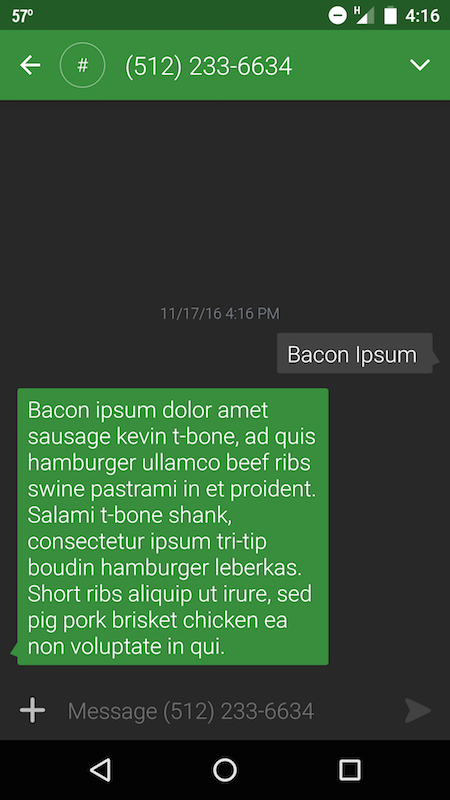 After discovering how easy it is to set up, I added text message support to Bacon Ipsum. Give it a try! Text ‘bacon ipsum’ to 512-233-6634. Props to @JBasoo for this little tidbit. 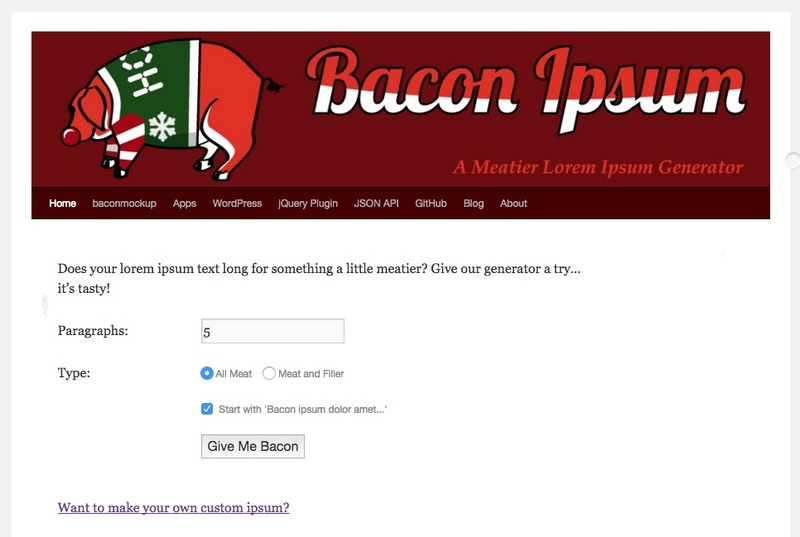 A few months ago, we published a blog posts on how to bulk generate posts using the WP-CLI and the Bacon Ipsum API. Well, now it’s even faster and easier. The latest release of the Any Ipsum plugin has WP-CLI support built-in to generate posts with filler content. First, install and activate the plugin from the command-line. By default, the plugin comes with Bacon Ipsum filler content. Then, use the new any-ipsum generate-posts command to generate posts. It defaults to ten posts, but you can pass in the number of posts to generate if you want more or fewer. There are several options, so check out wp help any-ipsum generate-posts for a full list of what you can do with it. Enjoy! New formats: ‘text’ and ‘html’ if you need responses in something other than the default JSON format. Ex: https://baconipsum.com/api/?type=all-meat&start-with-lorem=1&format=html (Thanks to Shawn Hooper for new formats). These same updates have been made to the Any Ipsum WordPress plugin. I recently attended WordCamp Miami and Shawn Hooper gave an excellent talk on using the WordPress command-line interface (WP-CLI) to manage your WordPress install. One of the items he covered was bulk generating posts so you have some initial content to use when developing a new theme or other functionality. Check out all the slides on his site. Using the “wp post generate” command, you can have WordPress bulk generate a specific number of posts. By default, these posts are empty, but by including a curl command to the Bacon Ipsum API, you can have the posts automatically filled with Bacon Ipsum filler content. The one drawback to this method is the results of the API call are used for every post, so each post has the same filler content. However, using a “for” loop in the terminal, we can generate unique filler content for each post. It takes longer to generate the posts, but you will get unique content. For example, this will generate five posts with unique content. You’ll get output that looks something like this. I’m also thinking of adding range values or a ‘random’ parameter to the API so you can get content of varying lengths, such as 1-5 paragraphs instead of always a fixed length. FYI, Shawn also contributed code to the Any Ipsum plugin at the beginning of WordCamp Miami to allow the API to return text or HTML instead of just JSON so he could use it in his talk. It’s really great to be able to incorporate a new feature right away and many thanks to Shawn for the new features.